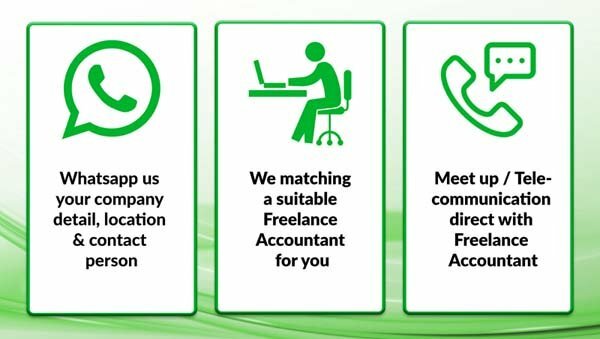 Malaysia Freelance Accountant Price : Please Contact / Whatsapp your detail to +6012-6241478, to get actual quotation. Hassle free customization of accounting and bookkeeping work. If you own a business in Malaysia, then you might be pretty much aware of the different accounting records you need to maintain to comply with the Companies Act 1965, Income Tax Act 1967, Goods and Services Tax Act 2014 and so on. Being busy with your daily business tasks and activities can make it difficult for you to maintain proper and accurate accounting records. In such scenarios freelance accountant Malaysia is the best buddy whom you can hire for yourself and get your accounting records maintained in a more accurate and precise manner. Bookkeeping Services Malaysia requires high expertise to give accurate results. Even a single incorrect entry can make your whole years accounting records go wrong. Accuracy is a very important matter for you and hence, a freelance bookkeeper Malaysia is the best solution for all your queries regarding booking keeping and accounting work. Why choose Freelance Accountant Malaysia? • The most important fact is that you would be left free from bothering about the accounting work and rather can concentrate more on your other business activities which need your attention more. • Cost effective bookkeeping services Malaysia is the best option to keep all the records up-to-date and get work done for small investments, rather than ending up in huge investments later for incorrect details recorded. • You also get additional customized accounting solutions and services which can be fruitful for easy business growth. • A Freelance Accountant Malaysia acts as your dedicated staff, hence, you can be assured of the confidentiality and security of your business details. • The accounting technology used by a freelance bookkeeper Malaysia is latest and up-to-date; hence, on-time accurate results can be expected. • Delivering a fully customized work which is as per the desired standards, rules and legislation is the core objective of a Freelance Accountant Malaysia. Apart from the above, there are many more advantages that you can enjoy by assigning a reliable Bookkeeping Services Malaysia. REDZONE Solution in the best in this area, you are just a call away from your personalized Freelance Accountant Malaysia. So, what are you waiting for, give a call today! Best business needs best expert accounting services. Access to accurate and timely accounting detail is not only important for documentation, but it also helps you to determine the growth of your business. The exact financial status and records are required to take specific steps for the betterment of business proceedings. Best accounting services are the one who act as your personalized staff, hence, you can always demand for reports and stats as and when required by you. Freelance accounting Malaysia includes accounting services and taxation services. Now you don’t have to keep tracks on the ever-changing and fluctuating tax rates. All these can be taken care by the expert freelance accountants for you. Your business accounts can be broadly classified into two – Financial accounting and Managerial accounting. • Financial Accounting: The accounting details of your business that you want the public (shareholders, clients, customers, etc.) to know. • Managerial Accounting: The accounting details that remain within the internal affairs of the business (salary, profit targets, cost of materials and so on). Hence, accounting is a vast and never-ending task which needs constant updates. It can be a difficult task to manage accounting single-handedly. Hiring freelance accounting Malaysia helps you with the yearly audits and tax compliance requirements. • Cloud Accounting Services: This is the upgraded version of the traditional accounting software which can help you with instant results and accurate accounting data. These services can be hired off-site, however, the costs required are far less than the one that you would invest in your workplace (resources). • Consolidation of accounts: This is best for you if you have more than one branches of your business. Hence, no more hassles of tracking records of all the divisions, experts are here to help you with it. • Payroll services: The payroll plays a very crucial and important role in a business. If your employees get paid timely and accurately they would definitely work more enthusiastically. Freelance accounting Malaysia can help you with all the payroll requirements for smooth running of your business. Accounting services are vast and include much more than mentioned above. Contact REDZONE Solutions and get the best services in Freelance accounting Malaysia. Bookkeeping services that you can count on! As per the Malaysia Companies Act, all types of businesses may be small or big are required to maintain proper books of accounts and other financial records. Hiring Bookkeeping services is the best to get relieved from the stress associated with maintenance of such critical data. The cash flow projections are something which helps you determine the exact financial position of your business. Even a minute mistake can end up with a huge error in the balance sheet at the end of the year. You can always hire a freelance accounting Malaysia services who are experts in accounting service. This would help you keep all the business records in a more comprehensive and accurate manner. Why you need the best Bookkeeping services? • Better financial management: Bookkeeping is the best tool to keep all the cash flow management systemized. Proper invoicing, follow-ups and on-time payments can save you from crashing down of the business if not handled properly. • Tax obligation fulfillments: Bookkeeping keeps a track on all the documents that are required and essential for annual tax returns. If the documents are not available on time, filing tax returns can end up being a horrifying nightmare. Hence, Bookkeeping services help you with all the data handy at the time of filing tax returns. • Handy information for investors: Well-maintained records are always easily accessible and hence, you would always be a position to put forth the crucial financial information of the business in front of the investors readily. • Better business plans: Balance sheet and profit and loss account are the only details to be referred to know if your business is on the correct track or not. However, its mandate for them to be accurate. • Compliance with law: Various laws need proper maintenance of accounting books, hence hiring accounting services and bookkeeping services is the best way to comply with these laws. REDZONE Solution is the best solution for freelance accounting Malaysia. Avail the high quality and affordable services today! The best accounting system set-up is the key to lasting success! Accounting system proves to be a boon when it comes to creating invoices, checks, list of products and services (sold/unsold), properly maintained credits and debits and so on. A Small Business Accounting System is the best solution for all the worries related to accounting and bookkeeping. • Accounting software keeps a close track on the health of your business and hence analyzes the improvement of your business tactics. Maintaining bookkeeping and accounting records manually can be a little difficult task for you. Small Business Accounting Systems are well customized and developed; hence, accurate and correct details can be expected in each and every go. • Speed: Accounting software gives the results in the best speed than any manual processing. • Accuracy: Customized software provides less room for errors. Hassle free and easy entries is possible with accounting software. • Business documents: Not only bookkeeping, but generating invoices, credit notes, purchase orders, statements, salary slips, payroll documents and much more are the other features provided by accounting software. • Easily accessible information: You don’t have to search into piles of files to get some important business information. Just a click and get all the details (past and current) in front of your screen. • Cost effective: Small Business Accounting System once set-up can help your business earn good returns as accounting software enable high productivity, help reduce expenses incurred on audits and so on. REDZONE Solution is the best choice who can help you get your business accounting department more customized and sophisticated. Investing a small amount today is definitely a better choice to earn high returns tomorrow. On 1st April 2015, GST (Goods and Service Tax) was implemented in Malaysia. GST submission can be a difficult task in Malaysia as the scope of the Malaysia GST policies is highly complicated than other countries. Hence, it’s recommended that you hire the best GST service that is capable enough to make your GST submission easy and effective. Goods and Services Tax (GST) is a value-added consumption tax. This tax is imposed on all the production and distribution stages of the goods and services. What type of GST services can be expected from experts? GST return reports and compilations. Easy filing of GST returns. Reconciliation between accounting records and GST. What points should be considered during GST submission for return? If your business annual turnover is above MYS5 million, then you are supposed to file GST returns on monthly basis. Filing can be either done by post or online submissions. All the invoices of the supply of goods and services must be produced effectively. Payments due can be received by bank transfer, money orders, cheques, etc. Why choose REDZONE Solutions for GST service? High quality: GST submission is a difficult and tedious job which can be well handled by experts, hence, helping you in saving a lot of time, money, and energy otherwise. Convenience: You can conveniently file your GST returns without worrying about the lengthy procedure required in GST submission. Cost effective: Hiring qualified and experienced accountants can be costly, hence, it’s convenient to opt for freelance accounting services to get the best GST service as well as goods and service tax service. GST submission is very important and has many rules and regulations invested. However, getting help from the best GST service providers – REDZONE Solutions is a simplified solution for all you worry related to GST.